LAS VEGAS, January 6, 2011 – JVC today unveiled two new additions to its home theater audio line-up with front surround soundbar systems designed to complement today’s high definition displays. Both the TH-BC1 and TH-BC3 deliver superior sound quality, provide connectivity to the latest home entertainment devices and are simple to set up and use. For the best possible sound experience both new JVC soundbars offer SRS StudioSound HD, comprised of SRS TruSurround HD and SRS TruVolume. SRS TruSurround HD processes up to 6.1 channels for playback over two speakers or headphones and uses proprietary algorithms from SRS Labs to optimize bass performance. SRS TruVolume eliminates volume fluctuations when switching from one source to another. The entry level JVC TH-BC1 offers easy setup and is a 60-watt (30 watts per channel), two-channel SRS StudioSound HD front surround soundbar with built-in FM tuner. The TH-BC1 features an analog input and two digital audio inputs (optical and coaxial) and a subwoofer pre-out. 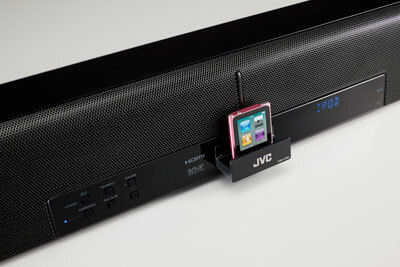 The TH-BC3 adds a push-open dock for iPod/iPhone and HDMI 1.4 – two inputs/one output. It features HDMI CEC connectivity, 3D ready video pass through, stand by pass through and ARC (Audio Return Channel) for easy setup and usability. The TH-BC3 also adds a composite video output for enjoying movies via iPod/iPhone. The TH-BC1 will be available in January 2011 for $149.95 and the TH-BC3 will be available in February 2011 for $249.95.